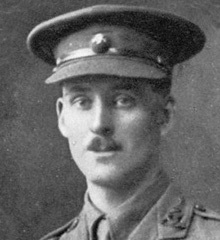 Ernest Daniel was the son of Robert and Marion Daniel. Ernest was born in Cheshire about 1884. Robert Daniel, an Englishman, was Justice of the Peace of Linen Finisher. They lived at Farlaugh, Tullyniskane, Tyrone. At the time of the 1911 census, the 27 year old Daniel was still at Farlaugh. His occupation is not recorded. 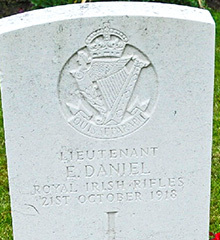 Lieutenant Ernest Daniel was with the 1st Battalion of the Royal Irish Rifles when he was killed on 21st October 1918 aged 34. Harlebeke New British Cemetery is located 32 kilometres east of Ieper town centre on a road leading from the N8 Meenseweg, connecting Ieper to Menen, Wevelgem, Kortrijk and Zwevegem.